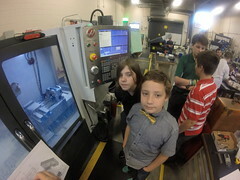 We just received more money to give to apprentices that want to learn how to be a CNC machinist in the modern digital manufacturing world. That will provide low cost training in an industry that will have you working in a year or less. Working in a field that is High tech, Clean and challenging. We need people who can think, learn and troubleshoot. Do real work that you can see. Currently in the US there are 800,000 jobs in the manufacturing middle skills area – Skilled trades that need more than High school degree but not all 4 years of college. An apprentice CNC Machinist technician fall in that category. We provide that start of one year training and internships that will get you that good paying job and a career for life. As you gain more skill you can advance to a journeyman Machinist or maybe design and CAD-Cam programming to produce code that the CNC machines make parts with. Some machinists become engineers and many companies will PAY for that college. A career that will always be needed and never stop learning . Travers Tool is proud to announce our first ever Metalworking Student Scholarship. Travers Tool will award $1,250+ in tools to a student enrolled in metalworking or welding program at vocational, technical school, community college or university. As your metalworking experts, Travers Tool is thrilled to sponsor the industry’s next generation of machinists. We start classes on Aug 13th. 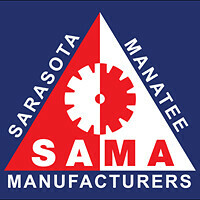 Suncoast Technical College – Sarasota, Fla. In less than a year you can become a vital worker in the high tech manufacturing world. Good people are needed to make many needed products for the medical – defense – plastics – automotive – motorsports and more. Just about everything that is made, a manufacturing technician/machinist will make. This is a clean high tech world would very comfortable air conditioned facilities. Our graduates make $14 – $20 per hour after graduation. Maybe You are good with your hands and like to tinker. We also like people who can do computer work to design and produce machine code to run the Computerized manufacturing equipment. You can be trained to be a quality control inspector as well. Our program is 40 weeks long and you will have a Career in Less than a year. You will be working on a paid internship before the end of school. You can apply for a scholarship to help pay for most or all of training. We train you to have a life time Career. Not just a job. I have never been without a job once I completed my school at age 26. Plus you will never learn it all – its a constant learning curve if you want – technology changes and you can ride along with it. So its up to you to see if you have an interest. 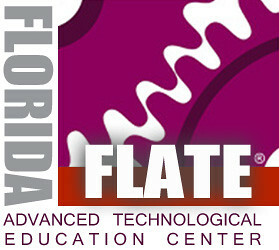 It was founded by a group of surgeons from the University Of Florida ( Go Gators !) We were able to see how Titanium Implants were made for Hips, Knees and Shoulders. The team at Exactech has been a great resource and last year they hired some of our top graduates. 2 of them , Mike & Jason, had passed NIMS level 2 CNC machining certifications. 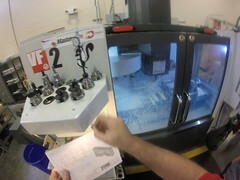 Now they need more machinists as they are getting 4 more CNC machines and just brought another 5 axis on line. We also got to tour the clean room. Thanks to Rick and the team at Exactech – Sarasota. I’m sure we will be able to supply them with interns this Spring. 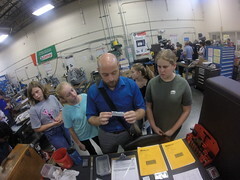 Next up was a tour this past week of Choice Mold and Tool – which is also connected to Oxtec LLC – a plastic injection molding facililty. They are also in transition from commercial molding to medical plastics with clean room for that industry that supplies large companies like Arthrex Manufacturing in Naples. Choice Mold was brought on to build more plastic injection molds for Oxtec LLC and other customers. They want to take on Intern this coming spring. Great news. we also had some of our drafting students come along to see a modern manufacturing facility. We are winding down for our Christmas break, having the annual Xmas party/cookout (well it is Florida?). We have been getting up to speed on other projects so that we can tackle proficiency in the coming months. We are using our Verisurf to do some reverse engineering and also to test out measuring on NIMS projects before we send them out for MecTec inspections. We also all machined a Titans of CNC 1M project as a CNC beginner setup and run job. Well here we are , Year # 5 and on Track to hit the 100+ mark of machinist training set by Dr Todd Bowden the SCTI director back in 2013. Dr. Bowden is now the Sarasota county School superintendent but he checks in every now and then. We have another great class and have completed our first semester of 10 wks. We dig into traditional manual machining and CNC machining. Learn how to read those blueprints , do a brush up on math and also learn technical details of all the basic processes of machining. Now we start to add CNC programming basics and how Computer Numerical Control works. So you have to have computer skills and hands on skills. From basic band saw to the 4 axis CNC Haas Mill. Later on will add to our quality control skills with digital measurement from Verisurf and the 3D gage measuring arm. So we have another 30 wks to go – and then it will be graduation before you know it. What do want to do in your career path? or you want a career change? Do you want to learn a Skilled Trade? in less that a year ? Where you can get a job anywhere in the US? Learn to be a machinist. A modern High Tech CNC machinist. Be part of modern manufacturing and making important REAL things. We have trained 85 modern CNC machinists and in the last 4 years that are all working in less than one year. Earn national certificates from NIMS that can help you get that better job. you can learn to makes things that count……. Florida residents pay only 1/3 of what a national private school will charge. Do you think this is for you? can you make things? do you like to figure out puzzles? can you be in a job in which you NEVER stop learning?